JIST stands for java in simulation time. We offer JIST project as a high performance discrete event simulation engine over a standard java virtual machine for academic project. We proposed a new prototype to build discrete event simulators called virtual machine based simulation which unify traditional system and language based simulator design we ensure an efficient simulation result to display output. We perform existing highly optimized simulation runtime in time & memory consumption. We determine JIST projects with raw event throughput, support process oriented simulation and C based parse engine simulation using a fraction of memory. We developed more than 90+ projects JIST Swans Network simulator with various approaches. Using java, we provide large benefits such as large library, well known to many developers, easy to use, garbage collection, type safety, and good IDE support and platform independence. We support JIST event scheduling with support and optimistic execution which cross VM boundaries and transparent for application. Delivery of events is simply a method call, where virtual machine checks compability of source & destination when receiving events no additional type checking is required by receiving entity. We delivery transfer class files, no source file is required. For simulation we use existing libraries & protocol implementation. When there is no explicit event data structure, there is no overhead for marshalling / demarshalling data. Using RMI, reference even based beyond VM boundaries. Transparent: Imply separation of efficiency from correctness. Standard: Write simulation in conventional as opposed to domain specific language designed explicit for simulation. Correctness: Assumed pre conditions which simulate programs compute valid & useful results. Efficient: Denote optimize simulation program statistically and dynamically by considering simulation state & event constraints to general purpose optimization. Design & implementation in Jist project: We implement & design Jist project from science direct papers. Simulation program: Written in java, an object oriented language. 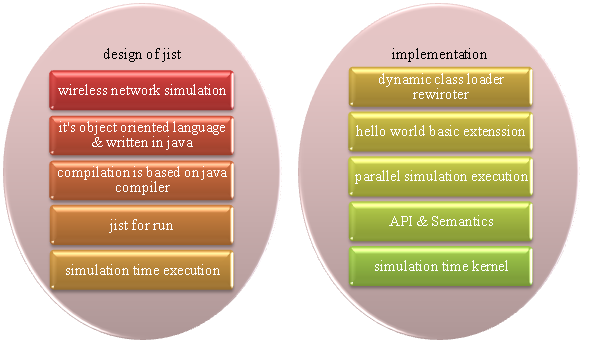 Simulation time execution: Compile & runtime component of Jist with any standards java compiler & virtual machine. System architecture: Simulation compiled by java compiler and run simulation by Jist. Hello world: Basic extension allows to write simulation programs. Rewriter: Jist rewriter component is dynamic class loader. Simulation time kernel: Control scheduling, clock and IPC. Language oriented benefits: Garbage collection, java, reflection. Hardware oriented benefits: Cost, portability. Application oriented benefits: Event structure, type safety, debugging. System oriented benefits: Java based, kernel, robustness, rewriting, inter process communication, distribution.